On May 17, 2018, BSA Space will premier NatureStructure, a global overview showcasing more than 30 architectural and design projects that work in harmony with nature to heal and restore ecosystems and make cities more resilient and sustainable. Curated by Scott Burnham, the creator of Reprogramming the City, with exhibition design and curatorial assistance by Samantha Altieri, NatureStructure will feature a vast array of international projects that weave built projects with nature and natural functions to enable cities and regions to function as living systems. The works on display include the US premiere of the Delfland Sand Motor, a feat of engineering that uses coastal tides to distribute sand along the coast of the Netherlands to reverse erosion and protect against sea level rise; Pop-Up, a revolutionary parking garage by Denmark’s Third Nature that rises in the city scape as its base absorbs rainwater overflow; and 3D printed reefs and seawalls by Australia’s Reef Design Lab to repopulate Sydney Harbor sea life and counter the depletion of reefs in the world’s oceans. Soon, we might have 3D copy machines. Using powerful new technology, MIT's latest 3D printer boasts, according to Russia Today, almost "human-free usability" which allows it to print "ready to use" objects comprising of up to ten different materials. 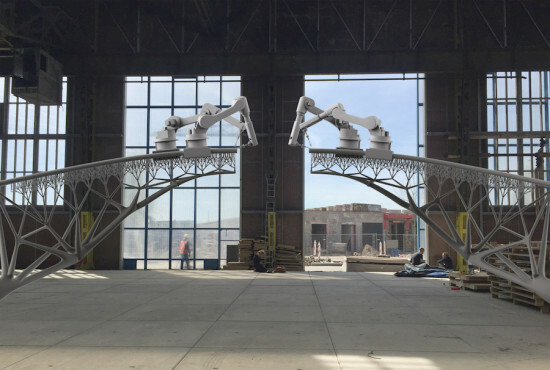 https://youtu.be/poRFPjiB9vw The development is being described by Gizmodo as a "giant leap" towards real-life replication as 3D printers strive for the ultimate goal of being able to produce functioning electronic parts. Already printers are capable of producing electronic circuits, however, MIT's printer named 'MultiFab' (echoing the name of the 'MultiVac' super-computer in Isaac Asimov's science fiction novel, The Last Question) is able to integrate these circuits into actual electronic components. This simplification of the manufacturing process hints at a future where a press of a button will be enough to produce such electronic mechanisms. A 3D scanner is also incorporated into the printer which allows the device to print onto existing components. This could mean that making future modifications to your smartphone, for example, is a very real possibility. Another advantage of this feature is that the printing process can be almost hands free. The scanner works in real time to make sure everything is aligned, telling the printer to make changes if necessary. In a release by the Computer Science and Artificial Intelligence Lab (CSAIL) at MIT, the research team has described their printer as, "high-resolution, low-cost, extensible, and modular." Advocating its possible use in education they also said that "students and teachers will be able to create complex mathematical figures, physics sets, lens systems, and anatomical models." A Shanghai building company has erected a small village of pitched-roof, 3-D printed structures—in about a day. WinSun Decoration Design Engineering Co is behind the series of humble buildings, a fully fabricated unit is expected to cost less than $5,000. The homes were created through the use of a 490- by 33- by 20-foot 3-D printer that fabricates the basic components required for assembly. 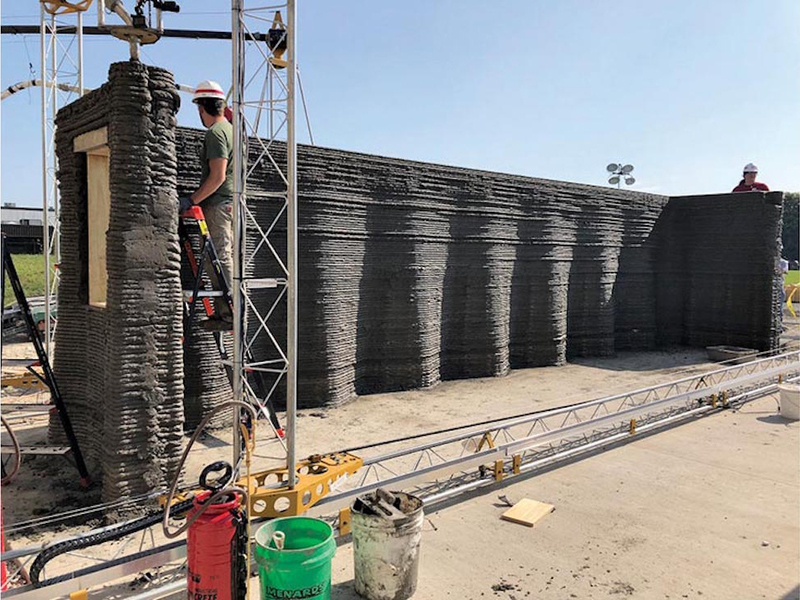 Rather than plastic, the machine behind these structures spits out layer upon layer of concrete made in part from recycled construction waste, industrial waste, and tailings. WinSun intends to construct 100 factories that will harness such waste in order to generate their affordable "ink," which is also reinforced with glass fibers. Purists will note that the WinSun productions are not 3-D printed structures in the traditional sense. Rather than projects like these, or the contour crafting processes championed by USC Professor Berokh Khoshnev, the Shanghai homes are not printed on site layer by layer. 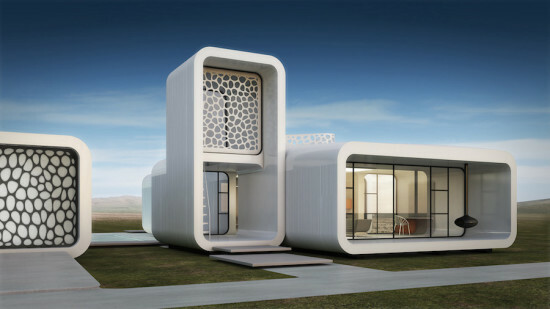 Instead they are composites of 3-D printed parts that require human intervention in order to be assembled into something resembling a house. WinSun estimates that their methods can cut construction costs in half and sees the potential for "affordable and dignified housing" for the impoverished. The rise of 3D printing, the design and creation of objects using a material printer, is currently hindered by accessibility. Few own personal printers or know where to go to use one. However, according to Lara Piras of PSFK, commercially viable 3D printing is now a possibility with Netherlands-based 3D Hubs. 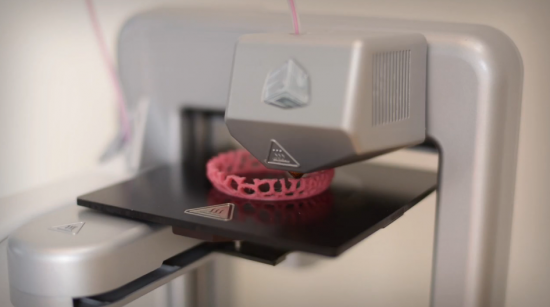 The online company allows at-home designers to connect with locals who own 3D printers, arrange for payment for the printing of their creations, and then receive their material products, ideally without leaving their community. Co-founders Bram de Zwart and Brian Garret envision their system as a reinstatement of local production, a reaction to current globalization, which they believe paints laborers as “faceless links in a complex and obscure global process.” Their 3D printing hubs allow citizens to design products and then see their production, means and end, face-to-face. After uploading designs to the 3D Hubs website, at-home designers can search for 3D printer owners in their area, arrange for payment to print their designs, and then pick up the finished product a bike ride or short walk away. It's been over three decades since the 3-D printer was invented, and to be sure, the technology has come a long way. 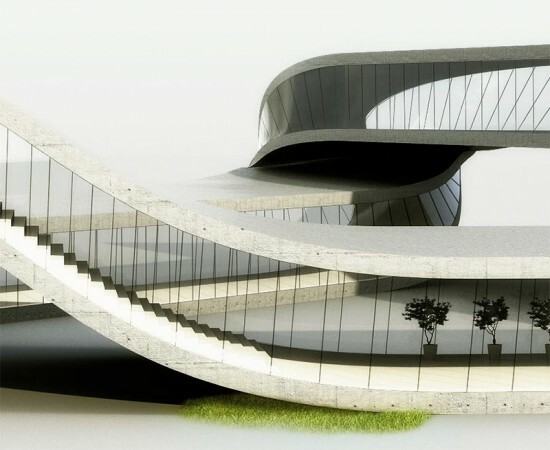 Now, Dutch architect Janjaap Ruijssenaars is putting the technology to the ultimate test by proposing to print an enormous Möbius strip house with over 10,700 square foot of house. The Landscape House, as Ruijssenaars named it, will be a two-story structure replicating the natural form of a figure eight by using “one surface folded in an endless Möbius band” he says on his website, intending for the building to effortlessly fit into the natural world. 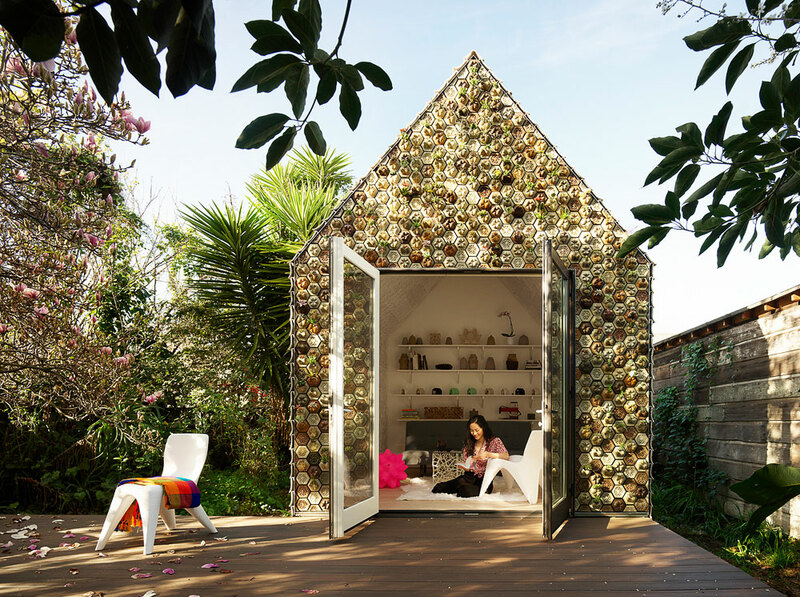 To complete the project Ruijssenaars will call upon designer Rinus Rowlofs and Enrico Dini, the inventor behind the D-Shape, a 3-D printer that will be used to print the Landscape House. It will be printed out in layers from bottom to top in roughly 20 by 30 feet sections. Each thin layer will be comprised of sand and a bonding agent to hold everything together. When the building is fully printed the loose sand will be dusted off to expose a marble-like finish on the final structure. 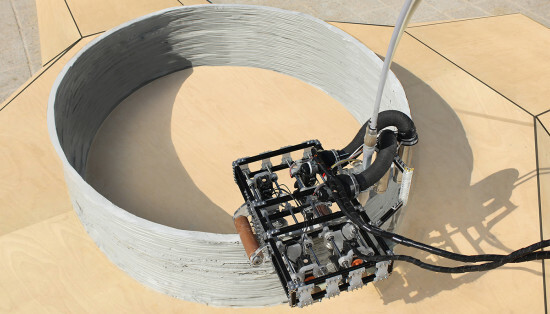 Fiberglass and concrete reinforcements will be added to ensure durability, as 3-D printing on this scale has never been attempted. The team hopes the building will be complete by the end of 2014 with a budget between $5 and $6 million. [Via C-Net.] 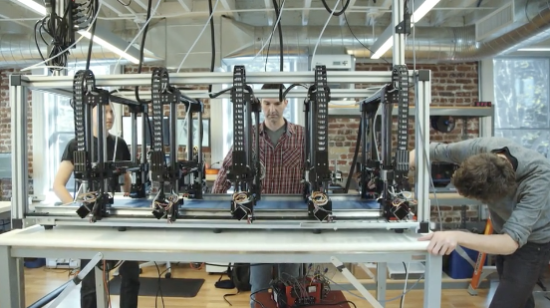 Check out how Dini created the D-Shape printer in the video below.